Ever thought to join Google+ in the coming days, which is an internet-based social media platform that is owned and operated by Google. If you have any plans to create a profile in Google+, then there is bad news for you! This coming Monday onwards i.e., 4th February 2019, you won’t be able to create a new consumer-level Google+ profile and on 2nd April all the consumer data will be deleted. That is, Google will begin deleting content from consumer Google+ accounts by April 2nd, 2019. Google will discontinue or they shut down Google+ service for consumer accounts from April 2019 onwards. Wondering What Issues Might Have Caused to Shut Down Google+ Account? Explore It Here! In October 2018, Google had announced the closing of Google+ profile by coming August. This is because the company has discovered a bug in one of its people APIs that revealed some private user data to third-party developers. Moreover, things went worse in December 2018 when another data leak had occurred, which impacted 52.5 million users. This is one of the major factors where Google will begin deleting content from Consumer Google+ accounts because Google decided to expedite the shut down by April 2019. Apart from that, the tech giant company also cited that Google+ account has got a very low user engagement and also imposed some flaws in the software design. This can be considered as the major reason for this shutdown decision: the discontinuation of Google + consumer accounts!! The Google will get-go deleting all content, including Google+ pages, videos, and photos, and everything else on the site before they completely stop its functioning. Therefore, before the shut-down of Google+ account on April 2nd, 2019, see all the other notable dates regarding the discontinuing of Google+ account for consumers. 4th Feb 2019: No new creation of Google+ profiles, pages, communities or events. 4th Feb to 7th March 2019: One of the Google+ feature for website commenting will be removed by Blogger on 4th Feb 2019 and other sites by 7th March 2019. Mid-Feb or Start of March 2019: Google+ sign-in buttons will come to an end to stop working and in some cases, it will be replaced with Google sign-in button. Start of March 2019: Google+ Community owners/moderators will be allowed to gain additional tools for downloading data. This includes the data such as author, body, pictures for every community post in a public community. 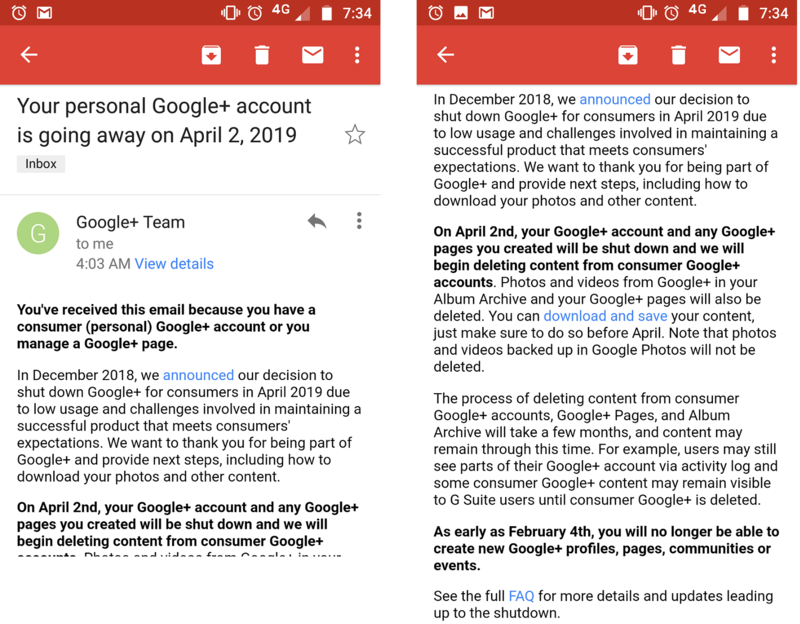 2nd April 2019: Finally, on 2nd April, Google will begin deleting content from Consumer Google+ accounts completely. In which, all the Google+ comments posted on all sites will be deleted and all the contents from consumer Google+ accounts will also be erased. Additionally, the complete photos and videos from Google+ user’s Album Archive and Google+ pages will be deleted. Moreover, the photos and videos, which is archived in Google Photos will not be removed. How Is It Possible to Backup the Data From Google+ Profile? If you are an avid Google+ user, then there is good news for you. As the tech giant company offers a plethora of options that allow users to backup the data before Google will begin deleting content from Consumer Google+ accounts. Google Takeout is one of the best options to archive some of the crucial data from Google+ account before Google start removing your Google+ data. In addition to that, Google provides Google+ backup tool i.e., Google+ Exporter App that will not only help you to export the data but also ensures to keep the data in a well-organized way. Here Comes an Update for G Suite Users! If you are a G Suite user, then Google+ for your G Suite account will remain untouched and active. Basically, the shutdown is only for the consumer of Google+ account information. So no need to worry if you are a G Suite customer. Meanwhile, you can expect a new look and some more additional features in the coming days. How to stay in touch with Google+ followers? It is advised to let your followers know the details where they can see your content outside of Google+ after the discontinuation of Google+ services. This can be done by creating a post that lists your blogs, website, other social media platforms or other mediums that will help you and your followers to stay in touch later on the shutting down of Google+ account. Is it possible where Google+ content may not be deleted from consumer Google+ profile? There is a chance that certain contents from Google+ will not be deleted, provided if it is required to complete any legal process, regulation, legal obligation or any governmental request. Is the access still active for other Google services after the deletion of Google+ profile? Yes, the access to other Google services is not interrupted even if Google will begin deleting content from Consumer Google+ accounts on April 2nd. Can I delete my Google+ account or page now? Yes, it is possible to delete Google+ profile prior to the termination date given. However, make sure to back up the data, which is required before deleting the account. I had already deleted my Google+ account long back, is there any more actions to be performed now? As you have previously deleted the consumer Google+ account. At the time of deletion, you might have received a notification that photos and videos of Google+ from Album Archive and Google+ Events would not be deleted. So now, this will also be erased on 2nd April. Therefore, back up your data before it gets erased. After knowing that Google will begin deleting content from consumer Google+ accounts. Users have started raising so many concerns on how to back up their valuable data from Google+ profile before Google will completely discontinue Google + services by April 2nd. This blog describes the main reasons for this sudden shutdown of Google+ account services by Google and all the necessary actions that can be performed so as to download and save the data from your Google+ consumer account safely.